A few weeks ago, it was announced that there was now a 3D printing vending machine over at UC, Berkeley (aka “Cal”) now. 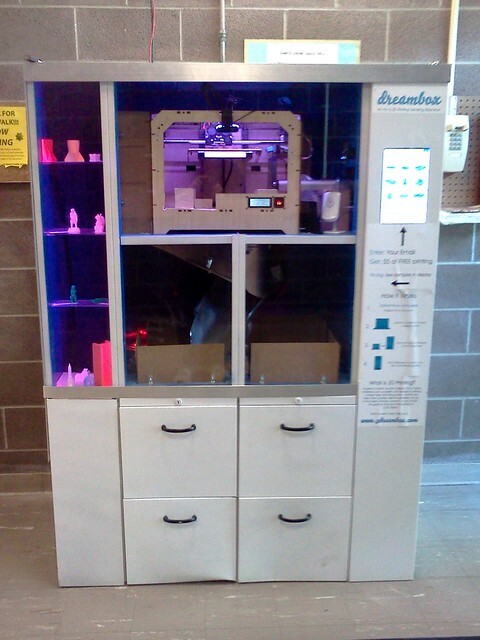 This is the creation of Dreambox, some startup or somesuch doing 3D printing vending machines. Without a lot of data, I sent my trusty minion (I mean “friend”), Zed Lopez, over to take a look at it for me. He took a few photos with his phone and I put them up as a flickr set. While I’m happy to see more exposure to 3D printing for the public, this whole thing seems like a bit of a bad idea. Printers like this that print in plastic are notoriously finicky things, with prints often coming out badly if conditions aren’t right or if the printer is simply not maintained and cleaned well. I don’t know how an unattended Replicator 1 sitting in a box is going to do well with printing materials on a reliably basis. I certainly wouldn’t want to own this Dreambox and have to maintain it on a regular basis. There is some hope that the machine will be upgraded or better though. I got a note from Dreambox this morning (where I had made an account) mentioning that the whole machine was going offline at the end of this week while they upgraded it. I assume they are going to make some changes to make it more reliably, maybe upgrading the printer to a new model. If anyone makes any prints on this machine, I’d love to hear more about how the process was for you as a normal user.